Make Dial-A-Temp your "FIRST" call !!!!! Qualified Temps in all fields. 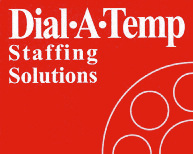 Dial-A-Temp, Hanover's oldest staffing service for over 38 years. We set ourselves apart from other staffing services by providing exceptional customer service and having a total understanding of the recruitment process. Dial-A-Temp has been providing their clients with consistent service and timely responses when filling their staffing needs. Dial-A-Temp's friendly staff has over thirty-eight years of staffing experience and understands the urgency of staffing their clients' needs. We go that extra mile to ensure our customers' satisfaction!